It might be spring break for some, but for those who are staying in the valley, there's plenty of live music and entertainment. Enjoy a special performance by Kelly Martin for Hailey Words and Music at McClain's Pizza in Hailey on Sunday, March 27, at 5:30 p.m.
Hailey Words and Music is a nonprofit organization that has a monthly performing arts series promoting artists in the Wood River Valley. Performances take place on the fourth Sunday of every month from September through May. Martin is a veteran of the music industry who has moved on from a successful band career to the world of the solo singer-songwriter. Born in Oregon, Martin was one of two singer-songwriters for the band CrashFour. He started his solo career after nine years, four albums and playing over 400 shows with the band. He has performed at the South-by-Southwest music festival in Austin, Texas, was sponsored by Budweiser College Agency and shared the stage with Collective Soul, Phantom Planet, Sugar Land, Ben Lee, Left Over Salmon, Young Dubliners, Roger Clyne and the Peacemakers, Built to Spill, moe, and REO Speedwagon. The show starts at 5:30 p.m. and aspiring poets, musicians, storytellers, actors and performers are encouraged to sign up at the door for the open stage. Other music around town will be the debut of Peelander Z on Tuesday, March 29, at Whiskey Jacques' in Ketchum. Peelander Z is a "Japanese action comic punk band" based in New York City. The band was formed in 1998. Band members say they are all from the "Z area on the planet Peelander." 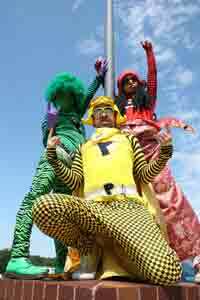 Peelander Z members don colorful costumes reminiscent of Japanese animation and describe their outfits as their skin. Their shows ask for intense audience participation and a chance to exercise with the band. "Do human bowling with us," said band member Yellow. "Do limbo dancing with us. Do karaoke competition with us. Hit our cowbell with us. Don't be shy—give us your smile. We can beat your stress. See you at our show."